All the compilations, divided into three categories: the absolute must haves, the interesting ones and the pointless ones. Each category is listed in date order. 5 CD set of unreleased gems, including the Trout Mask Sessions recordings and excellent exhaustive notes from John French. Excellent full career retrospective. A good introduction to the Magic Band and a superb selection of highlights and rarities for the rest of us. A vinyl only collection of outtakes from the ‘Wrapper’ sessions. Complete doubling of Safe As Milk and Mirror Man. 10″ album featuring six tracks from SAM and two from MM. Five tracks from SAM and two from MM. Dutch release featuring five tracks from SAM and two from MM. SAM with it’s track order reshuffled. I wonder why. All of SAM and three tracks from MM. Another pointless release featuring all SAM tracks in wrong order, hopefully the last. Eight SAM tracks plus two from MM and four from I may be hungry…. Shoddy compilation with spoken-word pieces edited in-between songs. Nasty. Compilation of earlier material from SAM, and MM Sessions. 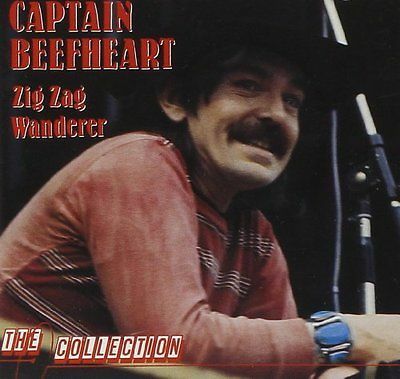 The Best Of Captain Beefheart & The Magic Band. Yet another pointless compilation. Spans whole career except Safe As Milk, Trout Mask Replica and Lick My Decals Off Baby which kind of undermines the accuracy of the title. It’s subtitled The Virgin & Liberty Years. Even more pointless repackaging of the above pointless compilation. At least it no longer claims to be a ‘best of’! A mix of tracks from the remastered Safe As Milk and Mirror Man Sessions. 2017 | Alex Snouffer | Anton Corbijn | Art Tripp | Bat Chain Puller | BBC | Benjamin Horrendous | Big Eyed Beans From Venus | Bill Harkleroad | Bluejeans and Moonbeams | Bongo Fury | Byron Coley | Cal Schenkel | Captain Beefheart The Biography | China Pig | Clear Spot | Collaborations | Covers | Creem Magazine | Dave Dimartino | Death | Denny Walley | Derek Laskie | Diddy Wah Diddy | Dirty Blue Gene | Doc At The Radar Station | Don Aldridge | Down Beat | Encounters in the wild | Eugene Chadbourne | Exhibitions | Frank Zappa | Freddy Bannister | Gary Lucas | Gary Marker | Graham Johnston | Grow Fins | Henry Kaiser | Herb Bermann | Ice Cream For Crow | Interview | Jan Van Vliet | Jasper Leach | Jeff Cotton | Jerry Handley | Jimmy Carl Black | John French | John Lennon | John Peel | Knebworth | Knoedler and Co | Kristine McKenna | Legendary A&M Sessions | Lester Bangs | Lewis Taylor | Lick My Decals Off Baby | Los Angeles Times | Magic Band reunion | Mark Boston | Michael Traylor | Michael Werner Gallery | Mike Barnes | Mirror Man | Mojo Magazine | New York Times | Nulsh | Old Fart At Play | Orange Claw Hammer | Orange Claw Hammer (band) | Outtake | Pachuco Cadaver (tribute album) | Pamela Des Barres | Retirement from music | Revenant | Rhino Handmade | Robert Palmer | Robert Williams | Robyn Hitchcock | Rolling Stone | Ry Cooder | Safe As Milk | Samuel Andreyev | Shiny Beast | Sounds | Spotlight Kid | Steal Softly Thru Snow | Steve Froy | Strictly Personal | Sundazed | The Artist Formerly Known As Captain Beefheart | The Dust Blows Forward | The Wire | Through The Eyes Of Magic | Tragic Band | Tributes | Trout House | Trout Mask Replica | Unconditionally Guaranteed | Victor Hayden | Wha?